Yesterday was a the first time in ages I had something green on me. The weather was quite nice and I decided to use my cotton suit day of the week today. I'm quite happy with how the suit fits, and will probably wear it like this till the season ends. When the winter comes there will be a lot of time to alter it the way I want. Especially like how it fits from the shoulders and along my torso. 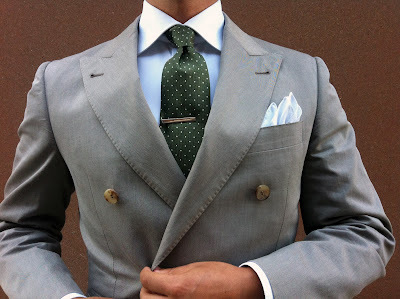 Anyway, today I decicded to take out my new olive pin dot tie from Berg & Berg. 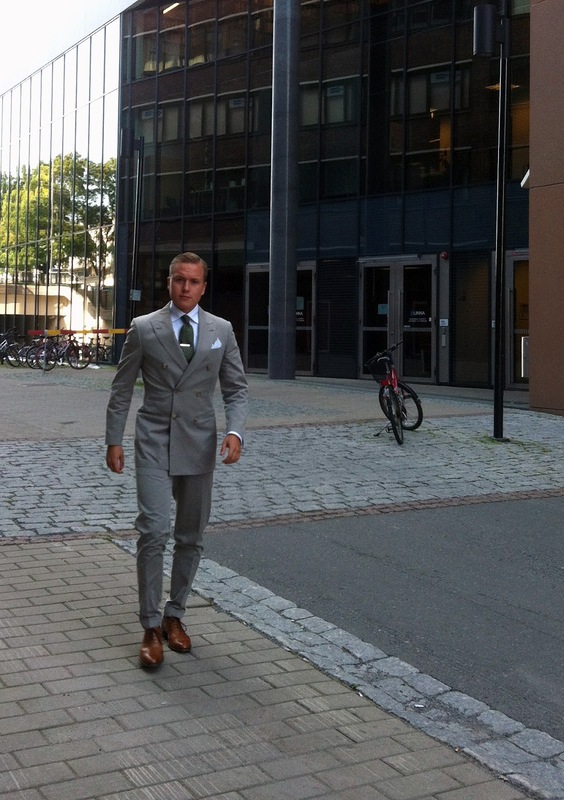 Pocket square is a plain white cotton square, bought from a small tailoring shop in Milan a year ago. I have to say, the way the collars on this shirt roll is just perfect. Note that if the collar points were at all shorter, this would not happen. Another reason to ditch those crappy fashion shirts. Oh, and I just love those nice horn buttons. I like using my Herring (made by Cheaney) brogues with this suit. The extra slim leg openings and legs make the shoes look sleeker than ever and the colors compliment each other. 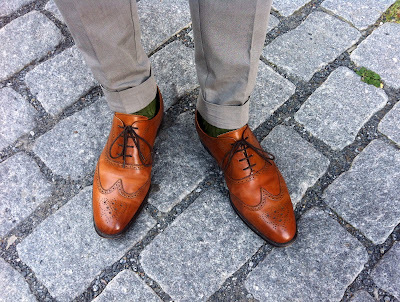 Actually, I think the tan shoes, light greyish brown cotton and the olive socks work together just perfectly here. Ans yes, olive socks are just fine here in my opinion. Flashy colored socks such as red ones work rarely, but a more played color like this faded olive is goes well and adds a nice detail along with the tie. The socks are from Berg & Berg as well.